Procrastination is a strange thing. I was doing pretty well with the daily thing for at least 2 months and then mid-March I stumbled big-time. Then the longer I wasn't posting, the less incentive there was to post. I came up with a few ideas to help me keep up, but never did them. I tied a number of knots including more Ashley knots and some seasonal ones not to mention finishing the give away tassels. While I haven't scanned the seasonal knots, I had long ago scanned the give away tassels. Why not post them? It's quick, no? As the offspring are fond of saying: "I dunno..."
Read more about Wanna See My Talk? 3- It’ll be done this year. 4- You have no clue what it’s going to be. The catch is that you must repost this on your blog and offer the same to the first 3 people who do the same on your blog. The first 3 people to do so and leave a comment telling me they did win a FAB-U-LOUS homemade gift by me! Oh, and be sure to post a picture of what you win when you get it! Who’s in? I fixed up yesterday's blogiversary post, but I don't know what that means to the RSS feeds, so I thought I would mention it here in this post. After I posted yesterday's link dump a few more came in. Since I keep links in tabs until I post them (I really should find a better method because this one often makes me sad when my browser crashes) I thought I'd take this opportunity to clear them out. A knot-heavy description of the events at annual Cub Scout Freeze-Out which took place on February 1, 2009 (presumably) near Austintown, OH. It's my one month blogiversary! With only a little bit of cheating, I've posted everyday. So, to celebrate I'm giving away a tassel with a hawk's eye bead in the centre and seed bead details. I was also thinking to give away the materials I used to make the tassel (a spool of cord, a selection of beads, and tassel fringe). Should it be all one prize or two? What do you think? I'll be documenting the creation of the tassel on the blog, of course. To enter to win the tassel, just leave a comment with a valid email (or register and post) on this post. Entries will be accepted until Feb 28, 2009 and a winner selected at random declared shortly thereafter. To start a 4 sided good luck knot, fold your cord in half and put it down, then pull 2 arms out of the side to make a plus (+) shape. This one has 18 facets (18JBD). The base bead is less football shaped (kinda pointy towards the poles, vaguely oval/eye shaped in cross section) and more oblate. The best I could do on short notice, but overall I like the resulting globe knot better. 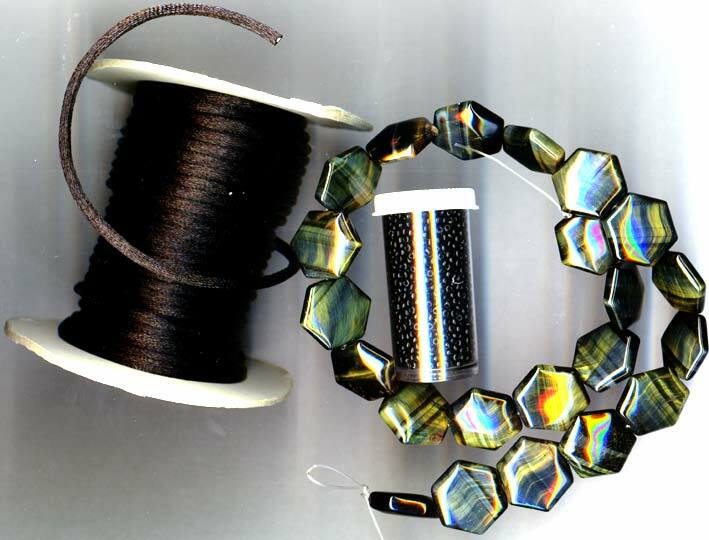 The question is do I like it better because of the core bead shape or because of the more facets to the globe? I'm going with the facet idea. 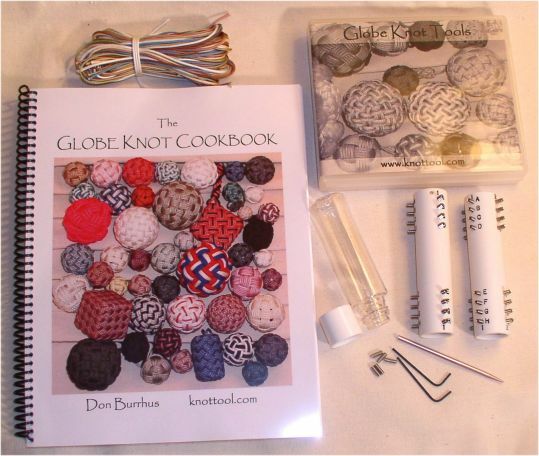 Don Burrhus has written (at this point) 3 books and sells kits to go with them. 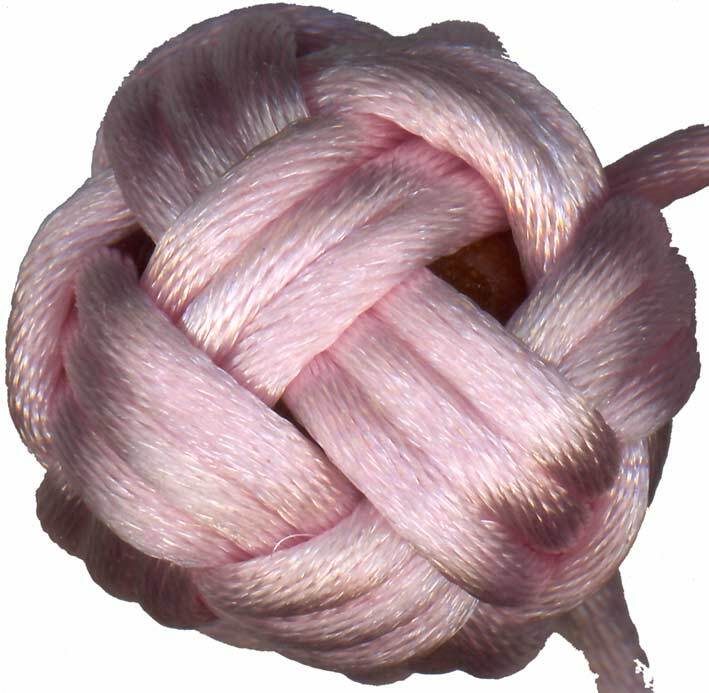 Two are about Turks Head Knots and the most recent is about globe knots. I have all of them, but I'll tackle the Turks Head kit and books more thoroughly at a later date. Could use some fine tuning. 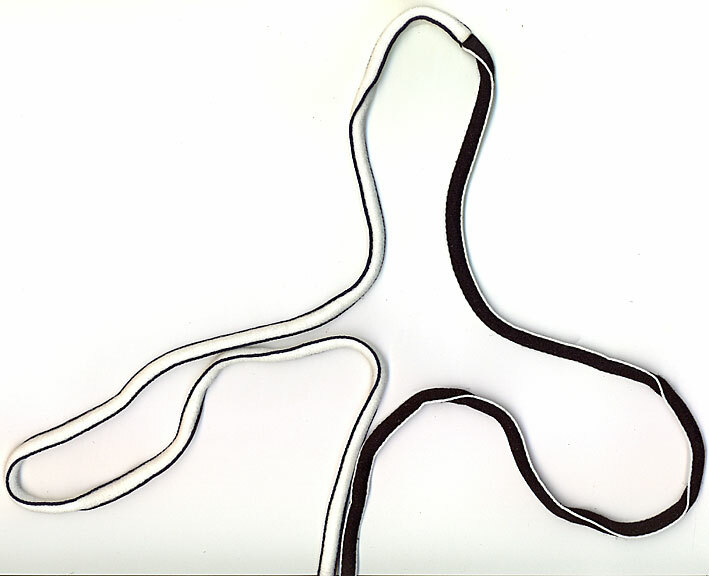 Read more about Like my logo? There I was thinking disgruntled thoughts about this other site where I couldn't find any "About Us" type information. "Always tell people who you are, fool!" I thought, "It's one of the first web rules along with 'Always tell readers where they are, don't expect them to know.'" But then I realized I hadn't made an "About Us" page for this site. Since I was starting from personal thoughts and starting by telling, effectively, my knotty friends who presumably (assuming, bad!) know who I am... Well, enough self-justification, time to fix the problem. Knotty Notions is a blog about decorative knotting (mostly Asian) primarily authored by Carol who also authors The Chinese Knotting Homepage, a reference site, and owns The Dao of Silk, an online retail shop for Asian craft supplies (but mostly Chinese knotting stuff, at least at this point). Back when I thinking of a name for my shop, I reserved a couple of names (reserve first and ask questions later is how I do domain name stuff, of course, being a packrat even with virtual things that can cause trouble...) while deciding. When I chose "The Dao of Silk" instead, I still had this snazzy name that I didn't want to let go. I thought: newsletter, magazine, or blog site! I'll use it for something!! What's the difference between a blog and a totally online magazine? I'm not sure. Multiple contributors and a less anecdotal writing style, maybe?